Here is a variation on the 4-square theme. The background is so simple. Just punch 4 squares and round opposite corners. The 1" square punch makes a decent size square for this template and the corner rounder punch can actually do all 4 squares at the same time (because the Designer paper is thinner than regular cardstock!). 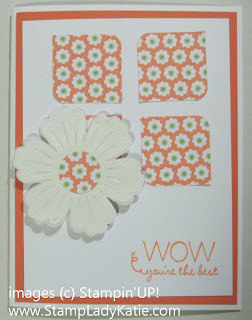 This card is one more sample showcasing a matched punch and stamp set combination. 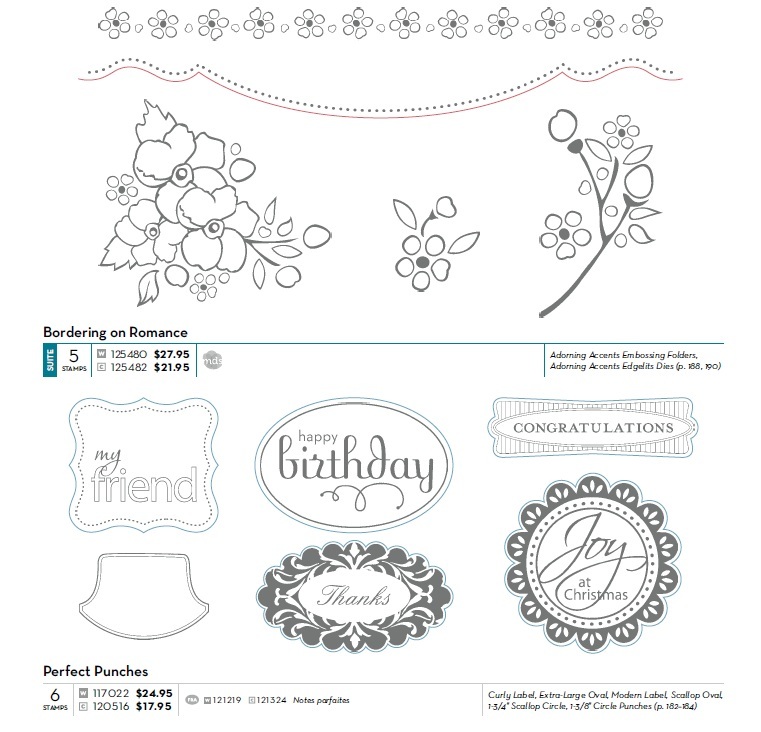 The flower punch is the Blossom Punch and the stamp set is called Mixed Bunch. It is so convenient to have stamped images that are a perfect fit for my punches. I'm so glad Stampin'UP! does this. Do you know the secret catalog code? Stampin'UP! has a "not-so-secret code" they use when printing the catalog to help you know when a stamp set has a matching punch or die. Check out this image from the catalog. Notice the red line in the image of the Bordering on Romance set. This means there is either a die or a framelit die that goes with this stamp set. Now notice the blue lines in the image for the Perfect punches stamp set. This means there are punches that match these stamps. Browse through the catalogs. Check out all the sets designed to go with punches. Stampin'UP! is doing more and more of this. Take some time to look through the Annual Catalog and the Holiday Mini Catalog and see how many matched sets you can find. Do you need a paper copy of the catalog? Please contact me and I'll send you one: 608-220-3450. Stampin'UP! makes shopping easy too. Once you've made your shopping list you can place your orders online HERE and have them sent directly to your house. My Thanks: When you place your orders through me you earn Customer Rewards Points. My way of saying thanks for shopping with me. Stampin'UP! 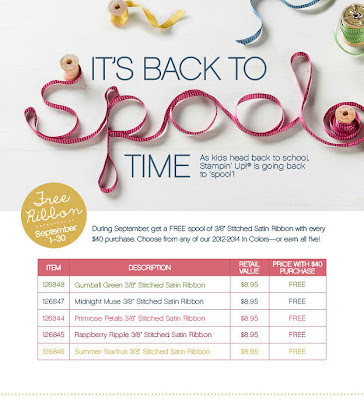 Thanks: This month, when your order totals $40 you will get a free spool of Satin Stitched ribbon from Stampin'UP!. caution: the ordering website may not prompt you to add the ribbon but once your order reaches $40 you can add the ribbon color of your choice and it will appear on the list as free. remember the ribbon special expires the end of this month so start browsing those catalogs now! Call (608-220-3450) or email with any questions about the ordering process.